I have a fantastic review coming soon for a Lands' End Women's Regular Original Fine Gauge Argyle Cardigan Sweater. But while I wait for my sweater to arrive for review, Lands' End and Fleishman Hillard want to make sure one lucky ready of So a Blonde Walks Into a Review wins one in time for the holidays. Made of 100% Supima® — America's finest cotton, the sweater comes in various colors in a classic argyle pattern. The softness lasts wash after wash and the cotton is pill-resistant. It's a Lands' End "Fit 2," which is their original, classic fit. It lands at mid-hip and is neither too loose or too slim. Please be aware that Black/Charcoal Heather and Rich Red/Ivory are both sold out. As of this writing, all of the eight other color combo options are available. To enter to win, simply leave a comment on this post letting us know something you love about Lands' End. Due to the timing of this giveaway, the winner must claim their prize and provide contact information within 48 hours of winning notification so that Lands' End can get your prize to you in time for the holidays. Be sure that there is an email address for you that I can find, or your entry will have to be disqualified. By entering, you automatically agree to all the rules and disclaimers listed here. Please also see my disclosure policy here. Deadline to enter is 11:59 EST, Wednesday, December 16, 2009. Winner will be selected at random using Random.org. Good luck! Oh, hey, this contest ends on my birthday! That would be a fun present. I love Land's End clothes. They are so durable and always so classy! I love all those sweaters. My fave is the Women's Fine Gauge Cotton Baby Cable V-neck Sweater. they have great kids backpacks for school and camping. I love that their clothing and backpacks are very durable! I would love to win this sweater! I like Lands End style of clothing and shoes. What I love about Land's End is the value for classic clothing that will last more than one season. They aren't just throw away clothing. They are durable and for the price it is a good value. I love Lands End products because they are all of high quality. I love this sweater. I like the styles of Lands' End clothing--very classic so it will remain in style for a long time! Thanks for the contest! They have the best quality products. Thanks for the chance. I love that they have clothes pretty much anyone can wear and pull off! I love their quality. I have never gotten a piece of clothing that hasn't lasted for years. I love Land's End because they include dogs in their great outdoor wear - they have fantastic pet items, super cute and funny! I love the clothes and prices are great! What I love about Lands' End is the classic style and fantastic quality of the clothing, they're awesome! I love Land's End's customer service and fast shipping! I love Land's End because you can order from their catalog and make returns at Sear's. The clothes are top quality too! I love their terrain ballet shoes. I know that's specific, but they are great shoes. I love their sweaters- they're stylish and high quality! I get my husbands polo shirts there & love it. The quality is always great & they always look stylish. I am a follower of your site! What I like about Land's End is that they address a wide range of customers and tastes. Also, I appreciate the fact that I can find any type of cold season gear on their website. I love the good selections of basic styles. I can always find what I need. I love they have plus size clothes for me! i love that their clothes are practical. What a gorgeous shade of yellow!! I love the TOP quality of all things Lands End makes, and I adore their return policy. They are very customer-driven. I like their Chino pants, thanks. I love the fact that they have great looking plus sized clothes too! I like that Lands' End partners with a number of cultural organizations in the communities in which they live and work (Madison Symphony, Summer Concert Series in Dodgeville, Stevens Point and Reedsburg etc.). What I like about Land's End--quality clothing for every life style (except maybe really dressy evening clothes!) at reasonable prices. I have bought several things at Lands' End and they are all high quality and well-made, besides looking great! I have two pairs of their mocs and love love love them! Their shipping is super fast too! Thank you! My favorite thing about Lands' End is that everything comes in so many colors! I often find a piece that I like (I love their pajamas), and I love that I can get it in 3 or 4 different color combinations. I love Lands End's super easy return policy. Following with Google Friend Connect. I like the 14 gauge cardigan cashmere sweater. What a great, versatile sweater. I love it! I like the Women's Regular 3/4-sleeve Boatneck Ponté Dress in spice brown. Thanks. I like them cuz they are fellow Cheeseheads! Land's End has a simply wonderful selection of bathing suits in all styles and sizes...Size is a problem with me, but I always know I will find something I like (and looks pretty good on me) at Land's End. I love the quality and durability of Land's End clothing. And they always have a great selection to choose from. I love knowing that if I order from LE the article will be a high quality item at a good price. Peace of mind is what I like about Land's End. I love that Lands End clothing is now sold in Sears, so that I can buy it locally! Thanks! I love that Lands End always has a large selection of colors/styles available, and the quality of their products in general. The quality of the material is great. I love that I can walk into the store, and find something for everyone on my shopping list. The varying colors and styles is just what I need. I love that all of their merchandise is of high quality. I love the quality and durability of Lands End clothing. i love their style of clothing, very chic and classy, thanks! I love the durability of Land's End. I have a shirt from them that I've have for years that is still one of my favorites and looks just as good as new! We have ordered a lot of items through Land's End from mens, womens, children's, and even shoes and household products. We always been very satisfied with the quality of the items, the quick shipping time and the high quality customer service. We've NEVER had a bad experience. I love the totes they carry. I love that they have such cute stuff! Thank you for the giveaway! Hi! I visited the website and I just LOVE Land's bold colors! land's end has a really nice variety of stuff! They have a good variety. I like the idea of stuff that's casual but still classy. I've always loved Land's End. My favorite product lately is their heavenly fleece line - soooo soft and cuddly. 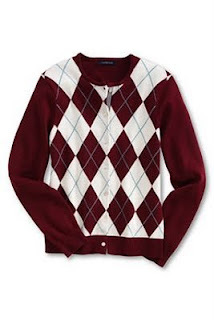 And I absolutely adore argyle - I'm so glad that it's "in" this season. I love the Washed Turquoise/Pine combo in this sweater. Thanks for a great giveaway! I love Land's End because their styles are timeless. I can always find something I like and the quality has always been very good. I Love that you can get gift at Land's End for $15 and under! I love the warmth & quality of all their products...Plus, it's all practical while still being stylish. They have so many stylish clothing! I love their customer service and prices! I love Land's End because they provide well-made clothing that will stand the test of time. Added button to my sidebar @ http://naddezsgoodycorner.blogspot.com/. I love all their outerwear. It's great quality!